This detox smoothie is packed with vitamins, minerals, antioxidants, and fiber. Plus it tastes like apple pie à la Mode. < – Okay, maybe not apple pie à la Mode, but something creamy and apple-y. I’ve shown you many-a-beet smoothie on The Roasted Root, but this one’s different. This one takes the Beet Smoothie Playing Field and skyrockets it into outer space. Made with cooked beets, apple cider, blueberries, coconut milk, cinnamon, and chia seeds, this smoothie tastes like freaking dessert. Typically in my beet smoothie posts, I say things like, “If you’re new to ‘green’ smoothies, this one’s not a good Intro To,” because the flavor of beets is hard to mask in a smoothie. And let’s face it: some people don’t like the way beets taste. I can’t imagine why.not. That being said, no such disclaimer is necessary this time around, because the smoothie tastes divine (not that beets aren’t divine…just that in the realm of flavors, they’re more down-to-earth than say, a marshmallow). The beet flavor doesn’t shine through because the coconut milk and apple cider meld together in a creamy, sweet ensemble. So basically, what you taste is creamy appcicle <- that’s like apple mixed with creamsicle. Coined term. It’s pretty baller. Which reminds me: have you added apple juice or apple cider to a smoothie? Apple juice/cider + berries = best smoothie evah! I learned this when I was in high school and all I consumed were berry smoothies and toast. Ugh, I just can’t stop looking at the smoothie. It’s such a pretty princess. Detoxifying: Blueberries and beets are full of antioxidants, which help cleanse your system of dammaged (oxidized) cells. They are also full of nutrients, which help replenish your Vitamin tank. Beets are full of manganese, potassium, copper, Vitamin C, Vitamin B6, and blueberries are packed with Vitamin K, manganese, and Vitamin C.
Boosts Metabolism: Blueberries, beets and coconut products jump start your metabolism and help burn fat. Energy Boosting: As opposed to spiking your energy level and dropping it like it’s hot, the natural sugars in the beets and berries come with fiber. Fiber provides substance for processing, ensuring the fructose doesn’t hit your blood stream too quickly. Supports Digestion: Fiber. 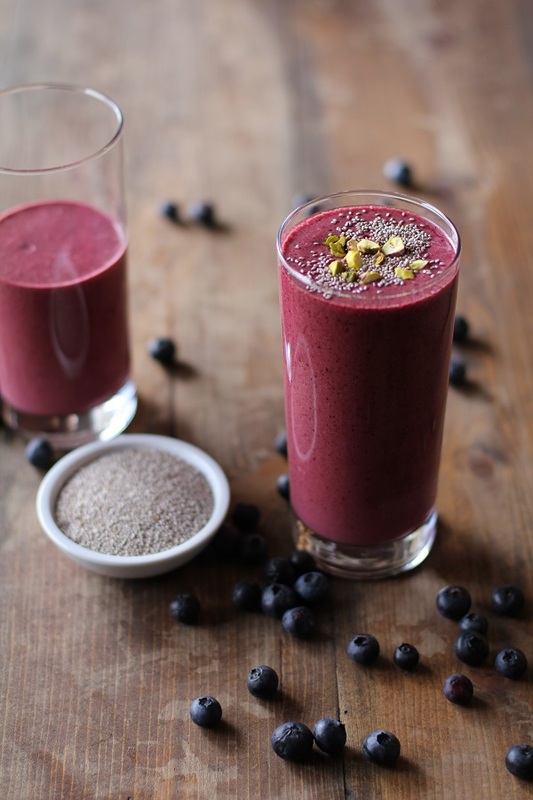 This smoothie is full of fiber, which is essential to regulating your digestive system. Coconut is also more hydrating than water because it contains electrolytes, so this smoothie is also very hydrating. It is important to stay hydrated for efficient digestion. Great for your Brain and Memory: Blueberries (aka brainberries) are touted as one of the best “brain foods.” They decrease oxidative stress on your brain and improve your capacity to learn and retain information. So drink this smoothie and then take the Bar exam. Or just.don’t. A note about the recipe: I used Love Beets cooked beets in the smoothie, which took alllll the roasting time out of preparing the beets. If you’ve never tried Love Beets, just note that their beets are on the smaller size. So if you’re roasting your own beets, don’t go putting 3 uuuge beets in the blender for this smoothie – that will not a good smoothie make. You’re looking at using 3 small-medium beets, which is roughly 6 ounces. 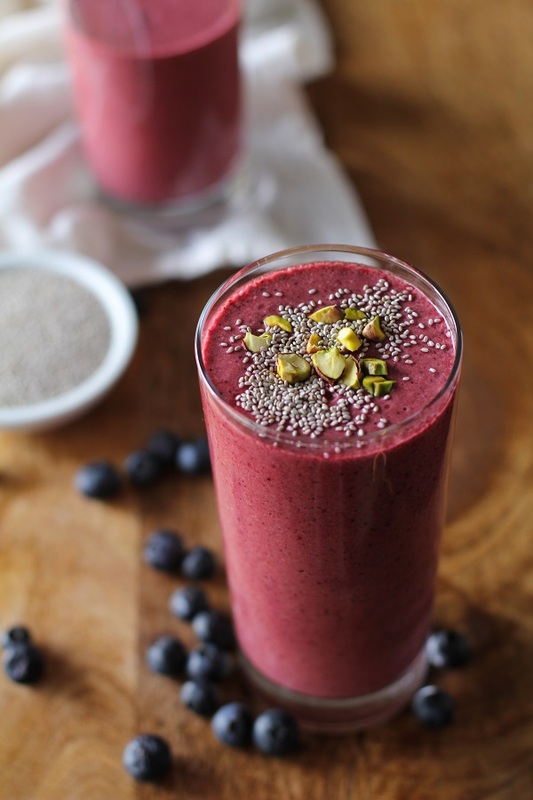 This Beet Berry Chia Seed Smoothie was originally shared on Love Beets. *Steam or roast raw beets until cooked through. I just started craving apple pie while I was reading this, sooo ya did your job real good there sister! I usually don’t go for beets in smoothies, buuut when they are whirled in with those berry beauties, I could get behind it! And a smoothie with beets? I can’t lie, I haven’t tried it. But all those magical ingredients are doing weird things to my noggin and I needs it RIGHT NOW. Seriously, the pre-cooked beets are awesome for throwing in salads or adding to veggie sautes – it really makes beets so much more appealing when you don’t have to cook them fooooorever and ever! 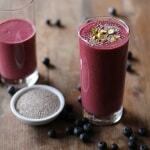 Hah, I almost did a double take because you and Liz posted beet + berry smoothie recipes today! Great minds! I’ve never added beets to a smoothie before, and I’m so intrigued by the color. Bring on the red/magenta/maroon smoothie revolution? Yesssssss! Julia this is such an awesome smoothie! I love that you cooked the beets too. I’ve always used raw which definitely leaves a “beet-y” taste to the smoothie so I’m definitely cooking them next time. Agreed, apple juice/cider is one of the best additions to a smoothie! Yeeeeeeeah, so glad you like it, Christina! I also like the texture of cooked beets better in smoothies cause it comes out smoother. Lemme know if you try out the smoothie!! An appcicle?! Oh man. If this smoothie tastes as half as good as it looks then I’m definitely in for a treat. It’s gorgeous!! this is such an awesome way to get those antioxidants!!! It IS a pretty princess! So I had to look up what beets look like (I hate veggies and gag down the same ones all the time ;)) and don’t recall ever seeing them but my husband says he knows where to get them! I looked at the recipe and was wondering if you could tell me about how much 1 beet weighs or the width or something like that. I’ve noticed that American produce is monstrous compared to German so I’m always left guessing. Does 2″ / 82 grams sound about right? I know it’s just a smoothie but my baker-nature hates guessing. 😉 Thank you! You’re the beet queen! Have I already told you that? I need to try beets in a smoothie ASAP. I mean, clearly. Gorgeous photos!! I think I’m in love! No, it has never occurred to me to add apple cider to a smoothie. Why? I’m not quite sure. This is why you’re the genius. Love this! Thanks, Anu. Let me know if you try it out! Could this be the smoothie that gets me to like beets? VERY POSSIBLE. Oh girl. You’ve gooootta try it! OMGosh this is amazing! Thanks for sharing. I started following your blog because of this smoothie. yum! Pingback: 20 Delectable Apple Recipes - Lynzy & Co.